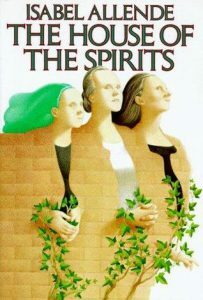 I first read Isabel Allende’s The House of the Spirits my junior year of high school. At the time, I was taken with the elements of magical realism that permeated the story. In the twenty years since, I have lost track of the number of times I have read this book. Each time, I gain new insight into this complex, multi-generational novel. Set in Chile, against the backdrop of social and political upheaval, Allende focuses on the ever-changing fortunes of Esteban Trueba, his wife, Clara del Valle and their children: Blanca, Jaime and Nicolas. While Esteban concentrates on accumulating wealth and power, Clara endeavors to strengthen her clairvoyant talents. Since childhood, Clara has been able to move objects and predict future events, such as the deaths of her older sister and parents. Although Clara cares for her husband, she leads an independent life because she abhors his conservative values. Following their mother’s lead, the children, and later Esteban’s green-haired granddaughter, become swept of up in the socialist revolution and subsequent military coup. Despite its dark themes, The House of the Spirit is a story of hope and survival. Allende’s characters often experience the worst, but retain an innate sense of right and wrong. Until the bitter end, they continue to believe in the basic goodness of mankind. The last time I read The House of the Spirits, I realized that despite the horrors she had just experienced, Esteban’s granddaughter continues to hope for a better tomorrow. Following her imprisonment, she encounters a woman whose spirit remains strong regardless of efforts to destroy it. Alba, whose name is Spanish for dawn, knows the conservative regime will end and life in Chile will improve for everyone. Allende, Isabel. The House of the Spirits. Translated by Magda Bogin. New York: Alfred A. Knopf, 1985.